Widely considered the best hotel in Eastern Europe, Four Seasons Gresham Palace is repeatedly topping the Conde Nast Traveler Gold List: in 2005, in 2006 and in 2007 (the hotel scored 98.8 points in 2007). As the list is put together based on the votes of more than 20,000 travellers it might give you an idea about the weight of this great achievement in the category of rooms, service, location, design. Lonely Planet authors write “This magnificent 179-room place created out of the long derelict Art Nouveau Gresham Palace, dating back to 1907, left us gobsmacked.” According to The Independent, “Sophia Loren has paid a visit and the Prince of Asturias, heir to the Spanish throne, also chose to stay here while on an official visit to the Hungarian capital.” Robin Williams not only stayed here, but also advertised this fact at his concert in Budapest. 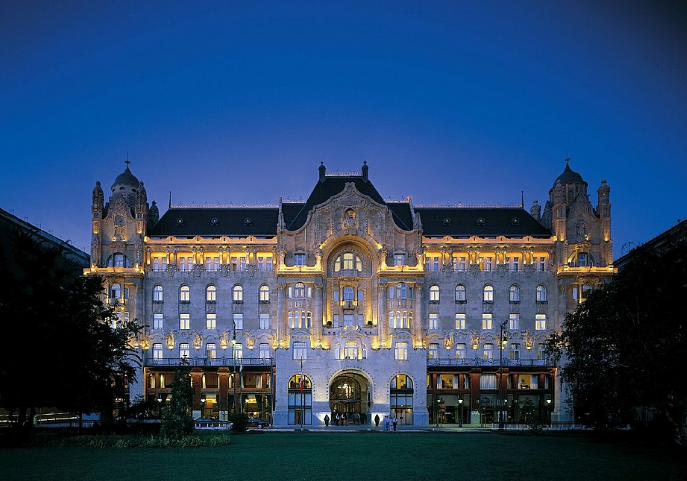 Go to the official website of Four Seasons Hotel Gresham Palace Budapest to make your booking. If you wish to stay in the city centre of Budapest, and, at the same time, have a breathtakingly beautiful view over the Danube, the hills of the Buda side of Budapest, plus the Buda Castle Budapest with the Matthias Church, the Fisherman’s Bastion, and the Szechenyi Chain Bridge feeling as if you stepped on the bridge, one of your best choices could be the world famous Four Seasons Gresham Palace amongst Budapest luxury hotels. The hotel is a 5 minute walk from Deak Square (Deak ter), the square where all major public transportation lines meet and provide access to any destination imaginable in Budapest. 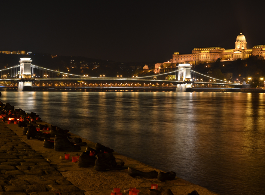 You can hop on any of the metro lines (blue, red, yellow), or the scenic number 2 tram, which runs along the River Danube offering a panoramic view, as if a land based river cruise in Budapest. Budapest Airport (former Ferihegy, now Liszt Ferenc International Airport) is about 30 minutes by car (14 miles / 22.5 km). 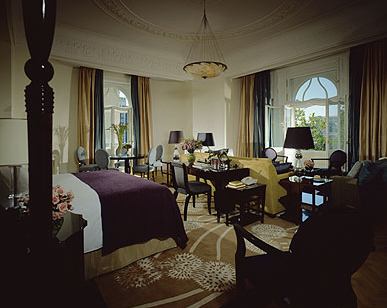 The 179 rooms of Four Seasons Gresham Palace, the smallest of which is about 335 square feet, “have Biedermeier-style furnishings and a careful use of the same shades of plum and sage that you’ll find in the public spaces” (Forbes Traveler). The full marble bathrooms have heated floors, and come with a wide range of complimentary toiletries for both adults and kids. In addition to the deep-soaking bathtubs, there are separate glass-walled showery and large vanities. For Heather Timmons (New York Times hotel review, 2005), the tubs seemed deep but smallish. Also, there was no completely separate toilet where she stayed. 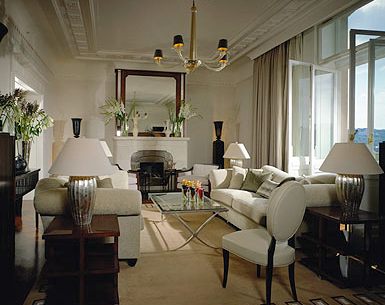 But most of the Premier, Deluxe, Superior rooms offer the WC in a separate alcove with a third telephone. To quote James Wallman’s review of Four Seasons Gresham Palace on Travel Intelligence: all rooms “exhibit the signature Four Seasons’ luxury. While all have large beds with just the right bounce and a desk for working or writing, it is the bathrooms that really sing. Almost as large as the bedrooms, black marble, red marble and glass slows your escape into this exciting city.” Some of the rooms offer a step-out balcony. 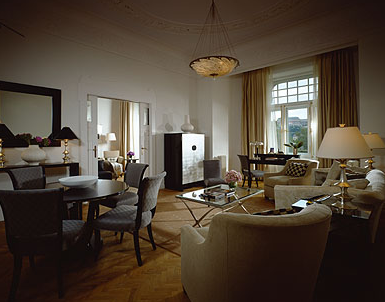 Danube Premier, Deluxe and Superior Rooms and the Royal Suite provide views of the Danube, the Chain Bridge, the Castle Hill, the Royal Castle and the Fisherman’s Bastion. The spa of Four Seasons Gresham Palace, which is on the top floor, offers a broad range of luxury treatments (body, facial, hand, foot – all using Elemis), massages, rejuvenating therapies in its 7 private massage and treatment rooms. 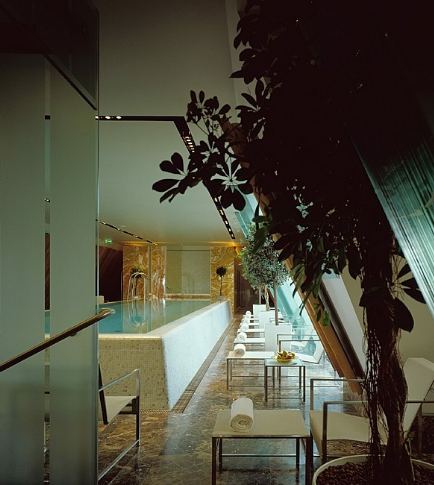 This in itself makes the Fours Seasons Hotel Gresham the best spa hotel in Budapest. The spa suite offers wet treatments including Vichy showers, separate steam rooms for men and women, whirlpool, sauna, fitness facilities. Body treatments include a special 110-minute Tokaji revitalising package, which sounds fun too: the mulled wine session (brown sugar and Tokaj spirit is rubbed in your skin) is followed by Vichy shower, then a gentle Swedish massage, and then again Tokaj spirit, this time on your face, plus a honey facial massage. Supposedly, Tokaj gives a good tone to the skin, and it is also good for re-mineralisation, while brown sugar “is an excellent exfoliant and antioxidant.” If you happen to fall for it, let us know what it was like in the Budapest Blog. You can also have an hour long physical and spiritual Healing stone package with rhinestones, amethysts, tiger’s eye & fresh grape-seed oil. Besides facial treatments there is a wide variety of hand and foot treatments, and after long walks on the streets of Budapest, nothing comes better than walking on cloud nine with a pampering foot treatment. There is a special Skin IQ for men treatment, which is claimed to be “the ultimate skin overhaul for men.” Massages range from aromatic Swedish massage through Super energising muscle massage to deep-tissue back massage. James Wallman says in his review of the spa of Four Seasons Gresham Palace: “It begins with the locker rooms’ deep, dark red carpet. Upstairs, under subdued lighting, a long lap-pool is backed by swirls of a deep, African yellow marble slab that leads to the whirlpool bath. Tiles in the steam room are in Moroccan red. ” By the way, the spa is only for adults over 18 years of age. The Independent (Rhiannon Batten) writes ” It’s tempting to spend more time in the hotel’s grand communal areas than its guest rooms, listening to a pianist in the lobby, quaffing your way through the vast (and reassuringly Hungarian- heavy) wine list in the elegant Italian-Hungarian restaurant, Pava, or stuffing yourself with gooey cakes in the Gresham cafe.” The Mediterranean-themed Restaurant of Four Seasons Gresham Palace got its name from the peacocks (‘pava’ in Hungarian), which you can also see in the masterful wrought-iron gate of the hotel. 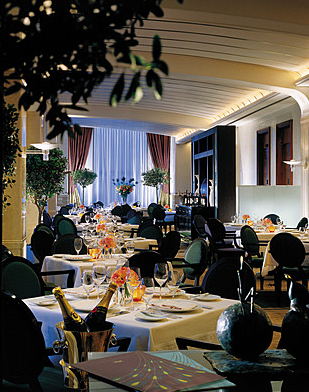 Besides the 78-seat restaurant, there is a private dining room (up to 14 people). 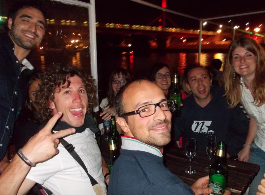 There are about 140 Hungarian wines if you wish to make a local palatal wine tour. “The Szepsy tokaji dessert wine is fabulous with the house’s foie gras. Save room for carpaccio of pineapple for dessert,” says James Wallman in his review of Four Seasons Gresham Palace (Travel Intelligence). Gresham cafe is adjacent to the Hotel lobby: coffees, afternoon teas, wonderful pastries, appetizers (e.g. foie gras), soups, sandwiches and from Thursday to Saturday the tunes of the 1900s, played by a jazz trio in the evening hours. As for the Bar, Heather Timmons in New York Times writes “The bar area that spills from the lobby, with dark wood furniture, purple velvet couches and a curved glass roof, serves martinis and complicated cocktails in ornately patterned glassware. The hotel welcomes children, who under 18 can share their parents’ room at no extra charge. Babysitting service upon arrangement and for extra charge (6 hours notice is needed), and concierge is ready to help you with any family program you have in mind. If you send the names and ages of the kids to the hotel, they will provide a welcome amenity, children’s body toiletries, child bathrobes (slippers is not mentioned on the website), and special children’s menus. What is more, you can ask for not only cribs/cots, but also different items to make your guestroom childproof, games, books, playing cards, colouring books, crayons and video games, as well as a baby bathtub, blankets, thermometers, high chairs and strollers, plus complimentary bottles, diapers, wipes, lotion, powder, shampoo and safety pins (all subject to availability!). But let’s see what one of the guests on TripAdvisor has written: “We were a bit nervous that the 4 Seasons Staff would be a bit snooty when introduced to our lovely 9 month old daughter but we couldn’t have been more wrong. We were asked her age when we checked in and a few moments later the receptionist formally introduced himself to her, welcomed her and gave her a gorgeous little wooden racing car. We were upgraded to a large room with an extra sleeping area with a cot for our daughter. The cot contained a basket of goodies and toiletries for babies! baby towels, baby lotion, nappy cream, bath oil, nappies and a little rubber duck for the bath….. not to mention the lovely l’occitane verbena adult toiletries in the bathroom. Room service was fab after our late night flight and we asked for a kettle (for bottles), a high chair and some spoons and bowls for baby food, all of which were delivered in minutes. The next day, at lunch, we asked for a banana for baby. It arrived, beautifully presented, mashed up in very cute baby crockery with spoon!” I think it speaks for itself. Everybody agrees on the fantastic panoramic location of the hotel and the glamor of this Art Nouveau edifice. Nevertheless, once you are splashing out on a five-star hotel stay in Budapest paying the high-end rates for your high-end luxury, it may be well worth making sure that you end up in a room facing the beautiful view of the River Danube (not all rooms are overlooking the river and the Chain Bridge) to avoid disillusionment and peeping at the courtyard and fellow travellers. Another observation is that the rooms are very decorative, although the bathtub might be a bit smaller than you expected – and talking about decor: the lobby is especially gorgeous as many say. The service is: ‘fab’ ‘you only need to ask’ ‘exceptional’ ‘friendly.’ What about complaints? First, that internet access comes at an extra charge, which some find strange these days, while others remark that the price is too high for it. Second, the concierge are less informed than guests expected: e.g. the cabs ordered by the concierge are not (always) the most optimal (more expensive than self-arranged taxis). Third, some tourists may find the room too simple, especially compared to the spectacular hallways: again, make sure that you communicate it in advance to the hotel what your priorities are. And finally, not a complaint but something that may be useful for some visitors: Pava Restaurant might appear to be more formal for younger folks, but Gresham Cafe is more relaxed and serves typical Hungarian dishes for lunch and dinner.